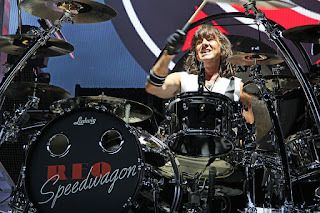 Hitt is the drummer for perennial favorite REO Speedwagon, which he joined back in 1989 for their release of the album The Earth, a Small Man, His Dog and a Chicken. The band liked him so much they kept him on for their next three albums, including Building the Bridge (1996), Find Your Own Way Home (2007) and Not So Silent Night… Christmas with REO Speedwagon. You might wonder how the band got its unusual name. It comes from a flatbed truck that one of the band members heard about when he was studying transportation history. The initials are those of the maker’s founder, Ransom E. Olds. Born in Center, Texas, a small town of about 6,000 near the Louisiana border, Hitt was no stranger to working with famous artists as his professional career took off. He’s performed with the likes of Cher, Graham Nash and The Spencer Davis Group. He’s also spent time in the studio with plenty of big names, including Nick Gilder, Gary Busey and Wang Chung. Hitt has been married to wife Cyndi since 1985. The couple has two children. You can see him in concert as the band is currently touring. If you’d like to get rich by being outrageous, you might try following in the footsteps of radio bad boy Howard Stern, who rakes in about $95 million or more a year. 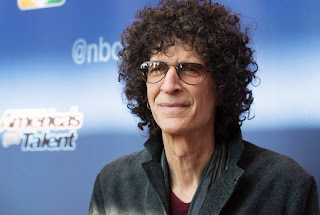 One of the original “shock jocks,” his radio show The Howard Stern Show flew up the charts during national syndication from 1986 until 2005, when it departed terrestrial bounds to emerge on the SiriusXM satellite station. Along the way, Stern became the most-fined radio host ever ($2.5 million) by the FCC for indecent content, won Billboard’s Nationally Syndicated Air Personality of the Year eight consecutive times, and was the first host to have the No. 1 morning show in both New York City and Los Angeles at the same time. He’s also been dubbed “The King of Media” for successful ventures such as television shows, pay-per-view events and home videos. Each of his books appeared on The New York Times Best Seller List at No. 1 and sold more than a million copies. Stern served as a judge on America’s Got Talent from 2011 to 2015, his ensuing notoriety pumping his salary to earn him a spot alongside Simon Cowle on Forbes’ list of America’s highest-paid television personalities. His contract with SiriusXM runs through 2020. Stern is married to his second wife and supports the North Shore Animal League America. He eats a pescatarian diet and practices Transcendental Meditation. He credits the technique with enabling him to quit smoking, meet his professional goals, put an end to obsessive-compulsive disorder and cure his mother’s depression. An excellent pole-vaulter in high school, Steve DeBerg channeled his athleticism to football and became the starting quarterback, then never looked back. He started in the same position at Fullerton College as a freshman, rallying the team to the South Coast Conference title as a sophomore. A transfer to San Jose State in 1974 resulted in that team garnering a Pacific Coast Athletic Association title, with DeBerg capturing the PCAA offensive player of the year award. In spite of his impressive talent, DeBerg would spend his long career in the NFL hopping from team to team, mostly as a backup player. Over 21 years, he played for six teams: the Denver Broncos, Kansas City Chiefs, Tampa Bay Buccaneers, San Francisco 49ers, Miami Dolphins and Atlanta Falcons. In his sole full year as a starter, DeBerg posted some impressive stats in San Francisco. It was 1979, and he led the NFL in completions (347) and pass attempts (578). His passing yards (3,652) made him fifth in the league, throwing 17 touchdowns that season. But if soaring passes were his forte, his Achilles heel were the accompanying interceptions, which numbered 21 that year. In 1980, he dipped to a low point with five passing turnovers in the Buc’s game against Dallas. Traded to the Broncos the next year, DeBerg had the misfortune to arrive in Denver just two years before the legendary John Elway took over the quarterback slot. However, he was excellent in his backup role, starting five times in Elway’s rookie year for a 4-1 record. After retiring in the 1983 season, DeBerg made history by making a comeback in the NFL at the ripe old age of 44, as backup quarterback for the Atlanta Falcons. He became the oldest quarterback to start an NFL game when he filled in for an ailing Chris Chandler against the Jets on October 25. 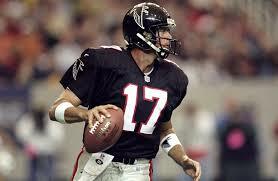 But after throwing nine of 20 for 117 yards and an interception, he was replaced and the Falcons lost the game 28-3. However, DeBerg also holds the record for oldest (45 years, 12 days) player on a Super Bowl roster for the Falcons’ Super Bowl XXXIII appearance. The pair sent out a press kit to 180 TV and radio stations, as well as the Associate Press and United Press International. The oddly titled comic created a buzz and enjoyed surprising success. 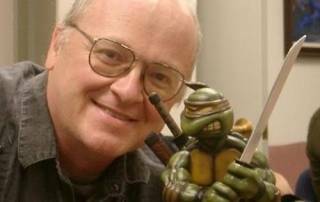 By the fifth issue, spin-offs included a book on how to draw the Turtles, a six-issue Turtle martial arts training guide, and Teenage Mutant Ninja Turtles Teach Karate. Laird eventually lost his love of drawing due to the intense pressure, only regaining it after a year had passed. Pressures from running the company continued to grow on both men, and in 2000, Eastman sold his share of the franchise to his partner and the Mirage Group. Nine years later, Laird in turn sold the franchise to Viacom while retaining some publishing rights. Perhaps Laird’s most lasting contribution after the hard early days when he had to borrow money to get the project going is the Xeric Foundation. The nonprofit provides grants for comic writers to self publish their work.